As the story goes, once told by a wise old man who was the grandparent of Charlie Bucket, no one goes in and no one comes out of the Willy Wonka Chocolate Factory. It is a magical day when Charlie decides to use his own money that he earnt from working at the local newsagent to buy a Willy Wonka chocolate. Little did he know, this chocolate bar held the last golden ticket available for a grand, personal tour of the Willy Wonka factory, the very same one his grandfather had told him about. 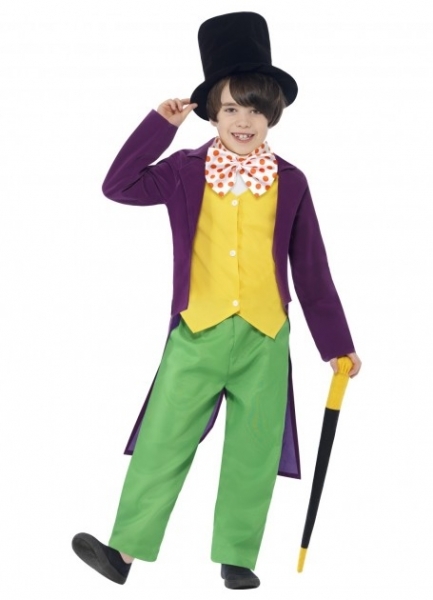 This Roald Dahl costume is custom made for any young child who wants to play the part of Willy Wonka, the one man who creates all the chocolates and sweets shared amongst Britain. Medium 7-9 Years 26" - 28" 22" - 24" 130-143cm 24"
Large 10-12 Years 30" - 32" 26" - 28" 145-158cm 28"